KickoffLabs stands out in its ability to create customized landing pages and track users. With KickoffLabs, you get 100% control over the CSS and far greater customization options. Plus, it integrates an affiliate program that rewards customers for referring new clients to your business, which is great if you’re looking to set up a viral referral scheme. It also queries collected e-mail addresses to retrieve a lot more information about your sign-ups without requiring you to add extra fields, and it allows you to sort your client list to discover the greatest influencers. It’s one thing signing up for a sole landing page creator, but KickOffLabs takes things further by providing the right marketing tools and features to actually help you get traffic to your site and generate an income. The main focus at KissOffLabs is their integrated affiliates programs, which reward customers for referring new customers to your business, and they do it well. With KickoffLabs you will benefit from integrated forms, email, newsletter builders and even a way to create your own affiliate program. Want to know if KickoffLabs is right for you? Choose from over 35 highly customizable landing page templates and opt-in form templates for your campaign. Selection: There are a fair amount of uniquely designed themes at the basic level, with a few more thrown in every pricing tier. Added features for some templates include mobile scaling and slideshows. 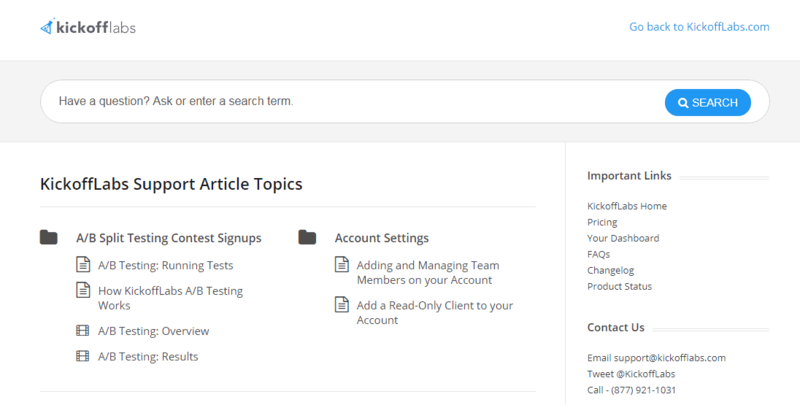 Customization: You can customize the basic elements of the page with the simple editor. 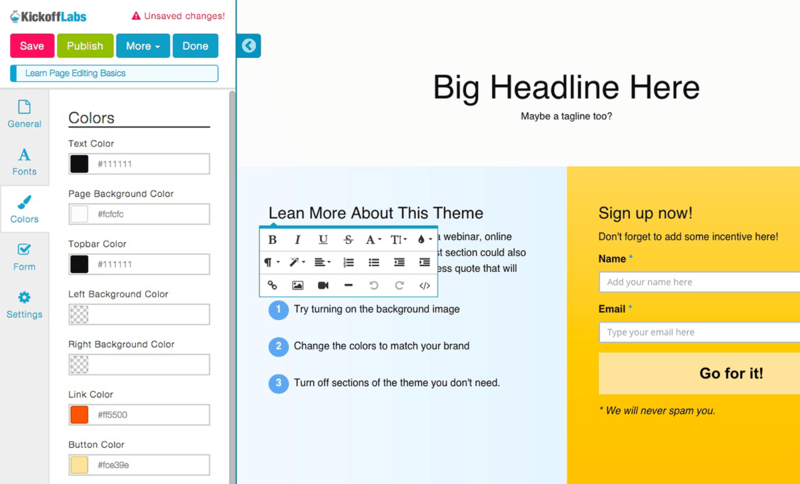 It also lets you customize the HTML, but you cannot start out with a blank design. KickoffLabs offers some decent features, many of which don’t kick in until the second level above free. If you are looking for a landing page creator that you can simply hit the ground running with then KickoffLabs is a good choice as the editor clutter free and easy to use. With every step of the creation process you can also see how your webpage will look, using the preview window. The main selling points to KickoffLabs is the integration of email blasts, newsletters, and, especially, custom affiliate programs. These are very handy tools that are easy to use and can up your marketing game considerably. KickoffLabs prides itself on being a very small company and they try and keep that feel by offering you email addresses of their founders, as well as a toll-free number if you have any questions. The support center highlights a good walk-thru video that will get newbies up and running quickly. Other than that, the knowledge base is extensive and easy to navigate, so you should be able to find an answer to most questions. Suggested ideas are often implemented in the product. KickOffLabs offer 4 pricing plans, suited for different client types. The Hobby plan entitles you for 5000 visits per month for under $30, but it’s features are very limited, you can only have 1 campaign at a time and you’ll have KickoffLabs Branding on your pages. To fully take advantage of all of KickoffLabs many features, you need to upgrade to Premium. Free trial is risk free and gives you 30 days to experiment with the features before you decide if the service is right for you. KickoffLabs makes it very easy to create landing pages quickly, but unless you are paying for a Premium account or above, the tools and features are quite limited. If you like drag-and-drop style editors, you better look elsewhere. It’s features like newsletter and email marketing, advanced analytics, customer incentives for social sharing and an affiliate program creator, that make KickOffLabs plans a good value for money. Like KickoffLabs review? Visit KickoffLabs.